From June 27 to July 4, 2013, Citysuper held an in-store cranberry promotion featuring dried cranberries, juice, health supplements, cranberry sauce, as well as cranberry breads and cookies. During the promotion, MZMC arranged a demo station which provided samples of dried cranberries, cranberry juice, and baked goods. Additionally, cranberry informational leaflets were placed at all of the checkout counters. Many customers that tried the samples ended up purchasing a cranberry product. Citysuper’s location, high level of foot traffic, and upscale customer base all contributed to the event's success. MZMC also arranged for a professional chef to conduct a cranberry cooking class on June 29 in which Citysuper’s VIP guests could learn how to make cranberry smoothies and muffins. The class was extremely successful with 16 attendees from 8 families having participated. The smoothies and muffins were especially popular among the children. Based on the success of this class, a second cooking class was held on July 6, 2013. Twenty one attendees from 8 families participated by making their own cranberry smoothies and muffins. The second event attracted greater attention and was again highly praised by participants. 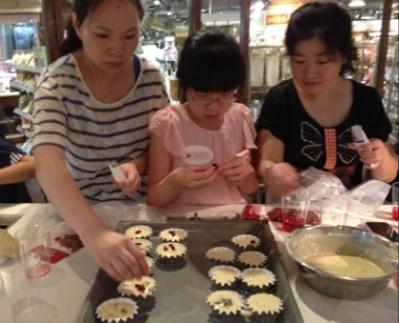 One family said that they attended the cooking class because they are big fans of cranberry products. Other attendees also expressed their intentions to purchase cranberry products. Overall, the Citysuper in-store promotion was extremely successful.